ESS Group, an environmental consulting and engineering services company, submitted the only bid in response to a request for proposals to study the Mill Brook watershed, West Tisbury selectman Cynthia Mitchell told her fellow board members at their meeting on December 3. Ms. Mitchell is a member of the Mill Brook watershed planning committee that is overseeing the RFP. The ESS bid was $45,000, considerably higher than the $30,000 allocated for the study at town meeting. Ms. Mitchell said that ESS, with offices in Waltham, Providence, and Virginia, expressed an interest in working with the town and other organizations to conduct the study within the set amount. “ESS expressed a willingness take some of the tasks in the RFP out of the mix giving some of the tasks to the Martha’s Vineyard Commission (MVC), who has looked at it and has agreed to participate,” Ms. Mitchell said. Carl Nielsen, an aquatic biologist and a vice president of ESS who met with the committee, will consider managing the MVC participation and the participation of any volunteers who might want to help with the study, she said, adding that he would be willing to work with the committee to help scale down the project to meet the monetary limits of the RFP. “He seemed quite willing to entertain all kinds of local partnerships,” Ms. Mitchell said. Ms. Mitchell said Sheri Caseau, MVC water resources planner, attended the committee meeting with a proposal for doing part of the work. Representatives of the Martha’s Vineyard Shellfish group also attended the meeting. Selectman Richard Knabel said that he is concerned that the project be a professional study. “One of the non-negotiables is that the contractor would be responsible and would oversee the work of any local partner,” Ms. Mitchell said. A similar RFP, issued last year, prompted only one response, due in part to the unspecific nature of some of the conditions and a cost limit of $15,000. 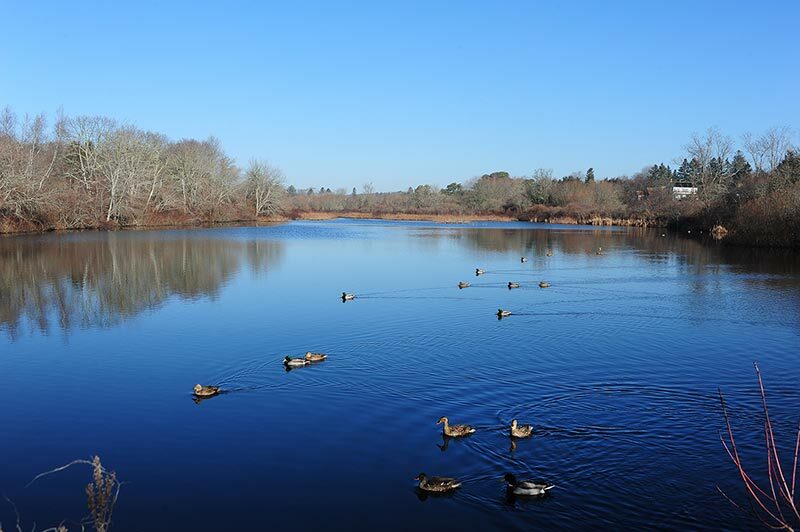 The study will look at the entire Mill Brook watershed ecosystem, including all streams and ponds, and establish baseline readings for determining the water quality and general health of the Mill Brook watershed and its impact on Tisbury Great Pond. The goal of the study is to collect data over the course of one year, from January 2015 to January 2016. In 2012 ESS presented the results of a study of the Mill Pond, one part of the Mill Brook watershed, and submitted three options for dredging Mill Pond.The plans ranged in cost between $240,000 and $700,000. The question of whether to dredge the Mill Pond, and the cost associated with that project, has roiled the town’s political waters for several years. There are those who want to maintain the man-made pond and its placid vista. Others want to remove the dam used to create the pond and allow the stream to return to its natural state, a change they say would enhance the spawning habitat of native fish, including herring, white perch, and eels, and allow free passage of brook trout. The next watershed management planning committee meeting is at 5 pm, Monday, December 15, at the town library. In other town business last Wednesday, selectmen voted unanimously to renew beer and wine licenses for two town restaurants, the Plain View at the Martha’s Vineyard Airport and State Road in North Tisbury. Mr. Knabel noted that the town selectmen’s holiday party, a potluck, will be at the Agricultural Hall from 5 to 8 pm, on Thursday, December 11. Correction: An earlier version of this story incorrectly reported that the next meeting of the watershed management committee would be in town hall on December 15. It will be in the town library.